When glancing over my bookshelves last night, I pulled a book which I ordered about a year ago, yet had not yet taken time to read. The reason I purchased it was because the author spent time in the book, providing an argument about Southern antebellum authors who went against the grain of many other authors of the time. A couple of the authors named had ties to the Shenandoah Valley. My well-worn copies of Conjectures. Fortunately, I’ve maintained the dust jackets by removing them every time I have a return visit to the volumes. When reading the first chapter (the book is titled Unwelcome Voices: Subversive Fiction in the Antebellum South) I realized the author (Paul Christian Jones, PhD) is one of those who follow in the path of Michael O’Brien. 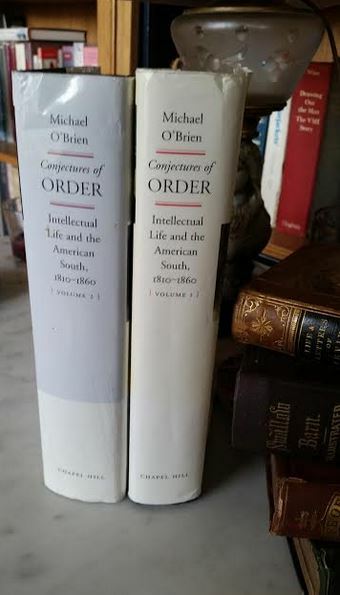 If you aren’t familiar with Michael O’Brien… especially his massive two volume work, Conjectures of Order: Intellectual Life and the American South, 1810-1860, I highly recommend it (or the abridged version… Intellectual Life and the American South, 1810-1860… which is only one volume). In Conjectures, O’Brien spent a significant amount of time showing the intellectual side of the antebellum South. O’Brien finds that the evolution of Southern intellectual life paralleled and modified developments across the Atlantic by moving from a late Enlightenment sensibility to Romanticism and, lastly, to an early form of realism. Volume 1 describes the social underpinnings of the Southern intellect by examining patterns of travel and migration; the formation of ideas on race, gender, ethnicity, locality, and class; and the structures of discourse, expressed in manuscripts and print culture. In Volume 2, O’Brien looks at the genres that became characteristic of Southern thought. Throughout, he pays careful attention to the many individuals who fashioned the Southern mind, including John C. Calhoun, Louisa McCord, James Henley Thornwell, and George Fitzhugh. Placing the South in the larger tradition of American and European intellectual history while recovering the contributions of numerous influential thinkers and writers, O’Brien’s masterwork demonstrates the sophistication and complexity of Southern intellectual life before 1860. “Magisterial,” “masterpiece,” and “tour de force” are some of the words reviewers have already employed to describe this work, the most important study of southern literature and intellectual life since Jay B. Hubbell published The South in American Literature (1954) more than half a century ago. Like Hubbell’s work, Conjectures of Order is written by an accomplished author whose encyclopedic knowledge of the region has provided valuable insight into long-forgotten and under-appreciated intellectuals. But while Hubbell focused his lengthy study on southern literature, Michael O’Brien branches out to discuss all aspects of intellectual life in the region, from previously explored topics such as theology, politics, and novel-writing to innovative chapters on letter-writing, conversations, and periodical literature. Given such an unpromising landscape, who would want to read an intellectual history of the antebellum South, much less become a historian of Southern intellectuals? Michael O’Brien has been working on an answer to these questions for fifteen years, and the result is a massive refutation of received wisdom. … and Charles J. Holden. (from Civil War History). O’Brien argues that the intellectual life of the antebellum South, far from being the product of an isolated, reactionary, frontier American society, was instead the result of philosophical, political, scientific, and cultural engagement with the latest that Europe offered. Of course, the reviews aren’t limited to praise and are also critical, but… O’Brien most definitely owned the topic. Sad to say, I also realized last night that Michael O’Brien passed away in May. For me, a person who often bores easily while reading, I’ve read Conjectures and reread chapters from time to time, in order to make clear what I thought O’Brien was suggesting. It’s a book I’m regularly referencing in my studies of Valley literature. This oversimplified depiction of antebellum southern literature has served to support the “story” of southern literature that was constructed in the early twentieth century. 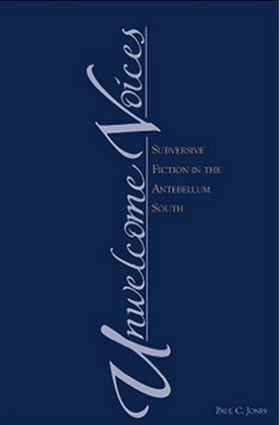 the work of prominent twentieth-century scholars of southern literature, including the New Critic and Agrarian Allen Tate and the major scholars of the succeeding generations, such as Jay Hubbell, Louis Rubin, C. Hugh Holman, and Lewis Simpson, has often endorsed this reductive view of antebellum literature in order to tell a larger story about southern literature as a whole. According to Michael Kreyling, these scholars, the students that they have trained, and the anthologies they have edited and published have “invented” southern literature, or put forward a version of southern literary history that they assert is true. According to this “invention”, antebellum southern literature – represented most often by the romances of Simms and Kennedy – was merely a mouthpiece for the region’s conservative, aristocratic politics, which failed as innovative literature and succeeded only in romanticizing a lifestyle that postbellum writers, like Thomas Nelson Page, would long for as they constructed their own myth of the Lost Cause, and with which modern writers, like William Faulkner, Robert Penn Warren, Ellen Glasgow, and Thomas Wolfe, struggled to come to terms. This “story” holds little respect for the achievement of antebellum literature and reveals little understanding that the literature might reflect more than a single ideological viewpoint. What appeals to me is the manner in which the “school of O’Brien” folks (in which I feel I might also be, considering my evaluation of various pieces of literature over the last year), have reached into something already declared (by others) dark and not worth recognizing, and have pulled up quite a bit worthy of our attention and recognition. The same, I would suggest, exists in the story of the antebellum South (dare I say, “white antebellum South”?) as a whole… though we clearly see, most especially now, the same form of denial in play, in both a segment of the general populace and even in those who have been academically schooled under a strikingly similar light which was generated by Allen Tate. Granted, this just occurred to me last night, and I have more reading ahead. I look forward to diving further into Jones’ work. I believe Genovese points out that various historians (and various others who dabble in history) are focused on magnifying the negative aspects behind antebellum Southerners, and whether intentionally ignoring or ignorant of the positive attributes and contributions of those same people, are more interested in axe-grinding than delivering balanced, thoughtful history. On the other hand, (at least what I’m seeing) O’Brien, et al. make an effort to reconsider people and works of the antebellum South, showing that, despite the focus on diminished significance (in the case of O’Brien and Jones, they recognize the intellectual and literary contributions of antebellum Southerners as having been “reduced”), we should still give credit where credit is due. I’m particularly fascinated with manner in which Jones traces the root of the diminished significance on early Southern literature to Tate. It’s as I’ve said before, I think we are able to see the complexities of antebellum Southerners, and understand how some of what they did conflicts with our contemporary moral views (and even how they were often conflicted with it themselves, and with each other in their society), yet we can also see how generalities, stereotypes, and even previous (and current) academic practice has only served to eclipse the positives of the antebellum South. Yes and though we may disagree on this point, I believe much of that is intentional. BTW, I’m still looking for that post-war novel written by the Valley attorney. I’ll notify you soon. I don’t know that we really disagree. I think, when we go back to Genovese on this exact point, we need to consider how what is suggested is measured. How do we measure what Genovese is suggesting? It might “certainly seem so” (recognizing the intentional effort) to any group of people. I think those who regularly read information delivered on a topic can see consistency and inconsistency in information… bias and balance… (if they are equally aware of both sides/all sides of the story) what is and is not being said. I think that this is measurable. Furthermore, I think we can also see how the information being delivered can be used to further a point, and when the absence of the other side of the information raises flags (especially to those who are aware of the complexities in a topic). In this, I think we can recognize than the lack of balance (only part of the story being told) is because the other side(s) of the story impede or complicate a point that one is trying to make. “I think we can recognize than the lack of balance (only part of the story being told) is because the other side(s) of the story impede or complicate a point that one is trying to make. True and the same thing is so about those trying to defend their Confederate ancestors/heritage. I tried, to some degree, address that issue in my book about Jackson’s Sunday school class. Absolutely true. I’ve seen a lack of balance there as well, and, in this discussion, I would be at fault for not equally recognizing a problem there as well as in other areas. As I said earlier, the “intentionally ignoring or ignorant” part applies here as well, and I’m afraid lack of an appreciation for the complete story is sometimes reflective of simple resistance against accepting anything but the story as “they know it to be”. I’ve often encountered it in my discussions of Southern Unionism and conscription. Genovese does a marvelous job of exploring much of this even further in his book, “The Southern Front.” Amazing. An avowed Marxist (at one time), does a better job of honestly exploring the “good” (and evil) in the antebellum South than most Southerners can – or are willing to even attempt.